Do you like mysterious grain of the Aztec? I love it! It makes a great lunch with some roasted veggies or a nice dinner with a piece of fish. And it’s super nutritious. Bonus! Wait, what’s that? You have no idea what mysterious grain of the Aztec is? Of course you do. It’s sooo hot right now. That was my brother’s doing. Ridiculous family-only inside jokes were usually his doing. He was quirky and hilarious and made the mundane moments of life hysterical. He composed a song we had to sing before we went swimming and choreographed a dance to go with it. "Ooh. Ooh. Ooh. A dingy dar nar nar nar." Over and over again while doing that knee-knocking Charleston dance around the perimeter of the pool. He informed me that my beloved Barbie dolls were made of the red wax wrapped around baby Gouda cheeses. I tried to fashion my own doll with the gross remnants of a week’s worth of snacks. He claimed that the middle of a Peppermint Pattie was made up of a mint-flavored snow from the North Pole, and yes, it was very possible that Santa stepped in it. The foil-wrapped treats became my absolute favorite. He told me that Family Ties was actually called Shah La La La. Remember the theme song? He was full of stuff like that and somehow I was always on board with whatever he said. He was my big brother after all. Mohan passed away 6 years ago. Every day I feel grateful that I have so many joyful memories of him and his weirdness. Things that remind me of him and make me laugh out loud. When I cook I often think about whether or not he would have liked the outcome. In this case, I’m sure the answer would be yes. You see I threw some mysterious grain of the Aztec in this gluten-free carrot cake. Weird? Yes! Delicious? Heck yes! Truth is, I have been really going off the rails lately with my sweets. Doughnuts. Toaster pastries. Ice cream sandwiches. Get a grip! No, I’m not planning on stopping any time soon. Let’s be real. But every once in a while I like to make something with a little nutritional value – and something I can share with my gluten-averse husband. (Homemade doughnuts for one. Bad idea?) 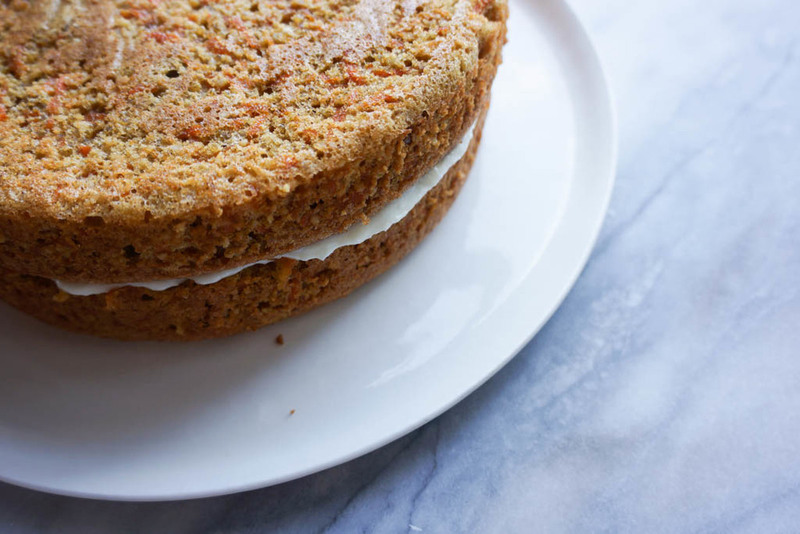 This time it was this tasty gluten-free carrot cake chock full of healthful ingredients: almond flour, coconut oil (which smells like heaven and dreams, by the way), shredded carrots, and quinoa. It's practically a salad! Ok. There might be a little bit of cream cheese frosting. Well...maybe a lot bit. So this isn’t exactly a healthy cake but I feel great about it. It’s a start. Macchu Picchu wasn’t built in a day. 1. Make the cake: Preheat oven to 350°. Grease two 8-inch cake pans and line with parchment. Into a medium bowl, sift together almond flour, cornstarch, baking powder, cinnamon, and salt. In a large bowl, whisk together brown sugar and egg yolks. Stir in carrot, quinoa, coconut oil, raisins, and vanilla extract. Fold carrot mixture into almond flour mixture. 2. In another large bowl, beat egg whites to soft peaks. Gently fold egg whites into carrot mixture. Pour into prepared pans and bake until cakes are golden brown and the center springs back when pressed very gently, 26 to 30 minutes. (The old toothpick test works too.) Let cool in pans on wire racks for 5 minutes then turn out and let cakes cool completely. 3. Make the frosting: In a large bowl, with an electric mixer, beat cream cheese and coconut oil until fluffy, about 4 minutes. Add confectioners’ sugar, vanilla, and salt and beat 2 minutes more. 4. To assemble, transfer one cooled cake to a serving plate. Spread about 3/4 cup frosting on top of the cake. Top with another cooled cake layer. Spread remaining frosting all over the cake. (I did a crumb coat but it's not essential. Just do what feels good!) Try not to lick your spatula before you finish frosting the cake but no one will know if you do. Trust me.